Home Blog Breed Info Do Pomeranians Shed? For a breed that is known for their full, fluffy coat, you may be concerned about how much your Pomeranian will shed. This is a valid concern to consider when thinking about bringing a new pup into your life and if the amount of hair your dog loses will be too much for you to handle. With myths about dogs with “hair” versus dogs with “fur,” you may even be asking yourself, “Do Pomeranians shed?” The answer is simple—yes. Unless you have a hairless dog, he will shed to some degree as part of the coat’s natural cycle, and Pomeranians are no exception to the rule. However, with proper grooming, you can help keep your Pom’s shedding under control. Pomeranians experience two types of shedding. The first type of shedding is referred to as the “puppy uglies.” This is the period of time when your Pomeranian loses his puppy fur and grows into his mature, adult coat. During this phase, your Pomeranian will shed more than usual. Your pup may lose hair unevenly in sections, and the coat will often change color. For example, a white puppy may shed and his adult coat will grow in with more of a cream tone. Your Pom will experience this shedding around four to six months, and should have his adult coat around 10 months. During this stage, it is normal for your puppy to look a bit scruffy, but it is still a smart idea to keep an eye on your Pomeranian’s skin for any abnormalities. In addition to the puppy shedding phase, Pomeranian shedding also occurs year-round. This year-round shedding is normal, and is relatively in-line with the shedding of an average dog. However, due to their full, long coats, it often seems like Pomeranians are shedding more than other dogs. When Pomeranians shed, a lot of the hair loss takes place in the under layer of the coat as opposed to the more visible top layer. It is important you brush your Pom every other day to help keep this hair from building up. If you do not keep up with regular brushing, not only can mats form, but your Pomeranian’s skin is also not getting the rejuvenation it needs. By brushing your Pom, you will help eliminate unnecessary shedding throughout the house, tough tangles, and a buildup of dirt and dander on your dog’s skin. Pomeranians are considered seasonal shedders, which are periods of time when they shed more often than others. This is most often triggered by a change in the daylight or a change in weather. During these times, Pomeranians experience heavy shedding, and in turn, you should increase your brushing from every other day to a daily routine. Setting aside a few minutes to brush your Pom will not only help you keep fur on the furniture and floor to a minimum, but it will also keep your pup looking and feeling his best. Another common question that arises in regards to Pomeranian shedding is, “Are Pomeranians hypoallergenic?” Unfortunately, there is no such thing as a hypoallergenic dog. Although some dogs experience less shedding and dander, all dogs produce this to some degree and can, therefore, trigger an allergy. A pet allergy is caused when someone is exposed to the animal’s dander or saliva, which is often attached to the hair they shed. All dogs have the potential to set off an allergy, but the American Kennel Club lists the Bedlington Terrier, Bichon Frise, Chinese Crested, Coton de Tulear, Irish Water Spaniel, Kerry Blue Terrier, Maltese, Poodle, Portuguese Water Dog, Standard Schnauzer, Giant Schnauzer, Soft Coated Wheaten Terrier, Xoloitzcuintli, American Hairless Terrier, Lagotto Romagnolo, Afghan Hound, and the Peruvian Inca Orchid as the most hypoallergenic dogs. 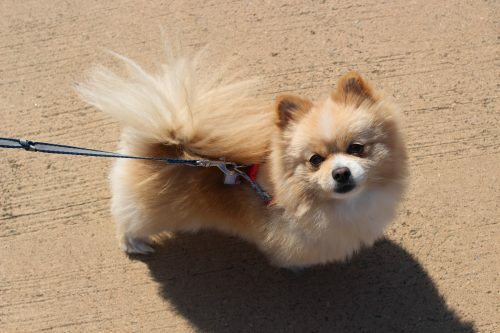 Since the Pomeranian does not fall into this category, it is a good idea to spend a significant amount of time around various Pomeranians before bringing one home if you are concerned about allergies. If you already have a Pomeranian and your allergies are starting to flare up, there are a few steps you can take to mitigate the pesky side effects. The first step is proper grooming. The more your Pomeranian is brushed, the more likely it is the fur and dander will end up on the brush and not in your common living spaces. Brush your Pomeranian daily, but do not over bathe him because that will lead to dry skin and more dander. Additionally, you should establish separate living spaces for the person with allergies and your dog. For example, instead of letting your Pomeranian having free rein of the furniture, he should have a designated dog bed. Your Pomeranian should not be allowed in the bedroom of the person with allergies. Finally, keep your living space as clean as possible by vacuuming up any potential dog hair and keeping surfaces clean. By following these simple steps, you will help alleviate some of the allergies caused by pet dander. Remember, there is no such thing as a completely hypoallergenic dog, but you can take steps to managing your Pomeranian’s shedding. Do Pomeranians Shed?” Cuteness, Accessed 21 Sep 2017. www.petpom.com/pomeranian-shedding. “Pomeranian – Physical Characteristics.” Petwave, 16 July 2015, Accessed 21 Sep 2017. www.petwave.com/Dogs/Breeds/Pomeranian/Appearance.aspx. Admin. “Pomeranian Dog Breed Information.” American Kennel Club, 6 Nov. 2017, Accessed 21 Sep 2017. www.akc.org/dog-breeds/pomeranian/. Allen, Robert E. “Grooming Styles for Pomeranians.” PetCareRx, Accessed 21 Sep 2017. www.petcarerx.com/article/grooming-styles-for-pomeranians/428. “Pomeranian Dog Breed Information, Pictures, Characteristics & Facts – Dogtime.” Dogtime, Accessed 21 Sep 2017. www.dogtime.com/dog-breeds/pomeranian.